The advantage of passive Vs active crossover has long been debated. There are many points for and against such setup. But if you search the internet, there is a new entity that comes up recently with the the advancement of computer technology and sound card and this is digital crossover. The advantage of this technique is that it stays in the digital domain and the signal can be accurately manipulated to generate the desired outcome. 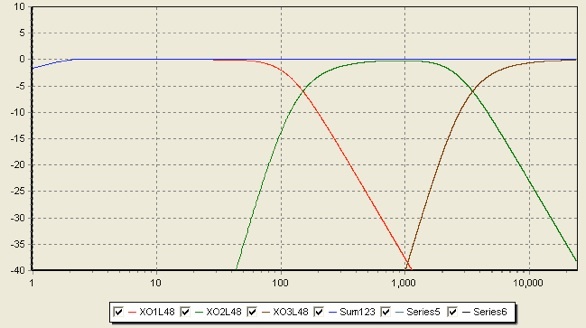 In the setup that I am current using, all the DSP is done with 64bit floating points to give the best accuracy – far better than passive crossover can achieve. The two most basic categories of digital filters are FIR and IIR. An analog filter will be IIR, while a digital filter can be either FIR or IIR. FIR stands for Finite Impulse Response, and typically, though not necessarily, these will exhibit a linear phase response. This means that as all frequencies propagate through the filter, they will arrive at the output at the same time. Finite Impulse Response means that the filter’s response to an impulse will settle to zero in a finite time. IIR stands for Infinite Impulse Response, which will be minimum phase (dual pass IIR to achieve linear phase being an interesting exception), and though the total delay might be less than FIR filters, some groups of frequencies may be delayed more or less than others (i.e. group delay). An IIR filter’s response to an impulse may last indefinitely due to feedback in the filter. 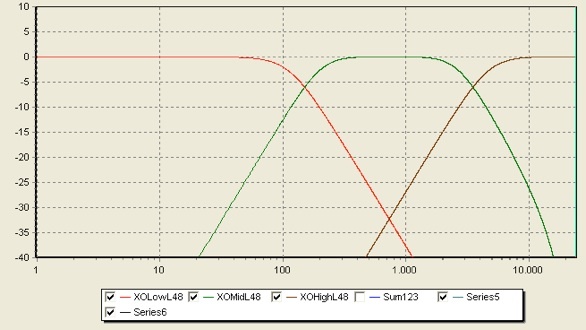 Both linear phase FIR and minimum phase IIR filters exhibit phase distortion. The difference is that the distortion is linear in one, and non-linear in the other. The linear phase filter introduces the same delay at all frequencies. The more aggressive the filter, the greater the latency through the filter. You can make an almost infinitely steep FIR filter, but you may have to wait until next month to hear the output. The pre-echo (often called pre-ringing) is the other obvious drawback. Post-ringing in IIR filters (and FIR) is less of a problem since it is typically masked by the signal. In Acourate, Uli has elegantly solved this in his latest software update. You can check this out in this web. So what does all this means in terms of sonic quality? In my experience, linear phase filter has a more forward soundstage with better transparency, dynamics and realism. The separation between instruments are more clear. With minimal phase filter, the soundstage is receded, transparency is less. And sound very much like passive XO and ordinary “high end” speaker. I have a number of friends coming over and said that my system sound is very strange and incoherent. The instruments are like playing separately in the orchestra. I then switched over to minimal phase filter and they are all happy. I guess they are just so used to this playback setup and forgot what the real thing sound like. I am a regular concert attendees and I think the real sound is closer to the linear phase than minimal phase. This is main concern about ported Vs sealed design. As we know, a ported design can produce better bass extension, but this bass extension is bought about by the port resonance. 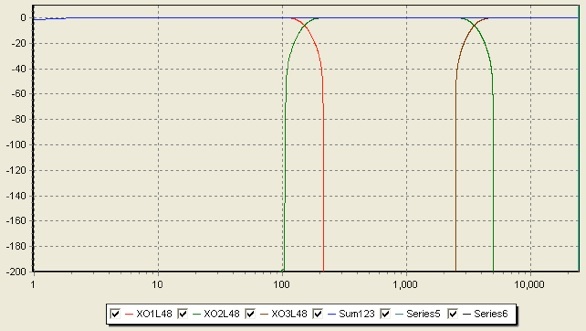 The frequency response and the phase behaviors is intrinsic to the speaker design. In other words, it is already determined by the box volume, the port size and length. 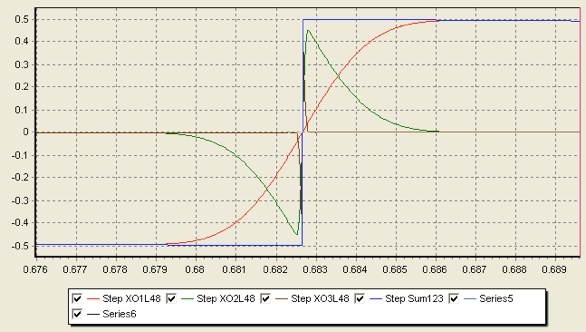 In digital crossover, we changes the behaviors of the driver based on measurement, you can even achieve boosting and suppression similar to Linkwitz Transform as well. However, there is no guarantee the port response will be what we want as it is not under direct DSP control. Using sealed box will not have this problem as all frequency response will be under direcet DSP control. Unlike closed box loudspeakers, which are substantially airtight, a bass reflex system has an opening called a port or vent, generally consisting of a pipe or duct (typically circular or rectangular cross section). The air mass in this opening resonates with the “springiness” of the air inside the enclosure in exactly the same fashion as the air in a bottle resonates when a current of air is directed across the opening. The frequency at which the box/port system resonates, known as the Helmholtz resonance, depends upon the effective length and cross sectional area of the duct, the internal volume of the enclosure, and the speed of sound in air. When this vent air mass/box air springiness resonance is so chosen as to lie lower in frequency than the natural resonance frequency of the bass driver, an interesting phenomenon happens: the backwave of the bass driver sound emission is inverted in polarity for the frequency range between the two resonances. Since the backwave is already in opposite polarity with the front wave, this inversion brings the two emissions in phase (although the vent emission is lagging by one wave period) and therefore they reinforce each other. This has the useful purpose if producing higher output (for any given driver excursion compared to a closed box) or, conversely, a similar output with a smaller excursion (which means less driver distortion). The penalty incurred for this reinforcement is time smearing: in essence the vent resonance augments main driver output by imposing a “resonant tail” on it. For frequencies above the natural resonance of the driver, the reflex alignment has no influence. For frequencies below the vent resonance, polarity inversion is not accomplished, and backwave cancellation occurs. Furthermore the driver behaves as though suspended in free air, as box air springiness is absent. This is a far more significant problem with vinyl record replay, because in this case there may be significant subsonic content in the audio signal, due either to warped records, or to turntable suspension wobbling or acoustic feedback. By their own nature, resonant systems cannot start and stop instantly. Ported speakers stagger two resonances, one from the driver and boxed air and another from the boxed air and port, in order to achieve their bass output, a more complex case than an equivalent sealed box. This causes increased time delay (increased group delay imposed by the twin resonances), both in the commencement of bass output and in its cessation. Therefore a flat steady-state bass response does not occur at the same time as the rest of the sonic output; rather, it starts later (lags) and accumulates over time as a longish resonant “tail”. Because of this complex, frequency-dependent loading, ported enclosures generally result in poorer transient response at low frequencies than in well-designed sealed box systems. Another trade-off for this augmentation is that, at frequencies below ‘tuning’, the port unloads the cone and allows it to move much as if the speaker were not in an enclosure at all. This means the speaker can be driven past safe mechanical limits at frequencies below the tuning frequency with much less power than in an equivalently sized sealed enclosure. For this reason, high-powered systems using a bass reflex design are often protected by a filter that removes signals below a certain frequency. One such filter is the rumble filter often built in to receivers or amplifiers designed to be used with LP records because of undesired LF rumble from the mechanical parts of the turntable, or from the strong subsonic excitation caused by warped vinyl discs. Unfortunately, electrical filtering adds further frequency-dependent group delay. Even if such filtering can be adjusted not to remove musical content, it may interfere with sonic information connected with the size and ambiance of the recording venue, information which often exists in the low bass spectrum. Whether or not the effects of these in a properly designed system are audible remains a matter of debate. A poorly designed bass reflex system, generally one that is tuned too high or too loosely, can ring at the tuning frequency and create a ‘booming’ one-note quality to the bass frequencies. In effect, this is due to the port resonance imposing its characteristics to the note being played, and is grossly exacerbated if the port resonance coincides with one of the resonant modes of the room, a not unusual occurrence. In general, the lower in frequency a port is tuned, the less objectionable these problems are likely to be. Ports often are placed in the front baffle, and may thus transmit unwanted midrange frequencies reflected from within the box. If undersized, a port may also generate “wind noise” or “chuffing”, due to turbulence around the port openings at high air speeds. Enclosures with a rear-facing port mask these effects to some extent, but they cannot be placed directly against a wall without causing audible problems. They require some free space around the port so they can perform as intended. Some manufacturers incorporate a floor-facing port within the speaker stand or base, offering predictable and repeatable port performance within the design constraints. This white paper describes some views about the application of crossovers. The goal is to show some unexpected effects and a new (?) approach for the design of crossover filters. Basically all items told here are not really new. But it seems that the idea to make the crossover filters in accordance to the good old passive crossover filters prevents from seeing the inherited problems. Luckily the use of digital crossovers allows to overcome the given limitations. Acourate offers such solutions. This is explained step by step to give insights and a better understanding. A common way to generate crossover filters is to make similar filters like found with passive crossovers. Passive filters are made of passive elements e.g. inductors, capacitors and resistors. The crossover network built with these elements behaves like minimum phase filters. Minimum phase filters simply spoken are filters that have the shortest possible phase deviations (= delays) to achieve a desired frequency response. As the passive crossover is a causal system the reaction on an input signal takes place after the signal. The best possible answer for a driver would be a Dirac pulse response. But the Dirac pulse means a flat amplitude response and we do not want to have a flat response. We want to have a flat passband where the signal passes and a stopband where the signal will be suppressed. In between there is a transition area. The transition area and the stopband have a different amplitude behaviour by definition. Thus the signal is influenced by amplitude and phase changes. The phase change means that the input signal gets delayed in the corresponding frequency range. Let’s take a view on an example. It is given as a standard 2nd order Butterworth filter (12 dB/octave or 40 dB/decade slope in the stopband) for a 3-way system. The crossover frequencies are arbitrarily selected as 150 Hz and 3500 Hz. Now let’s have a look on the time domain signals of the filters as created by Adobe Audition. Acourate allows the display of both time and frequency domain. It is possible to load and view 6 independant signals. 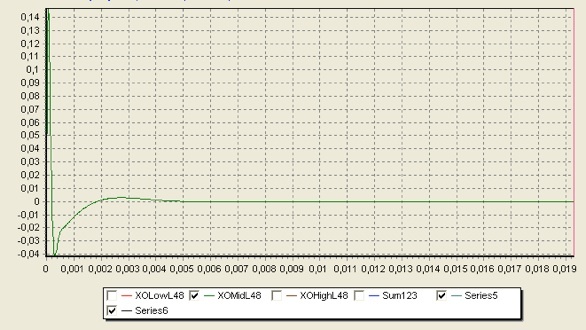 The graph for each curve can be switched on/off by the appropriate checkboxes. 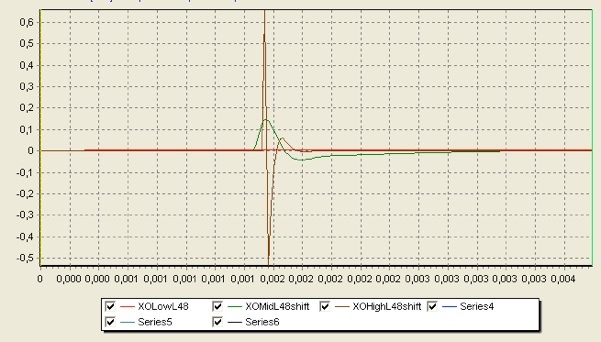 The next picture shows the behaviour of the lowpass time domain signal. The signal has a max. 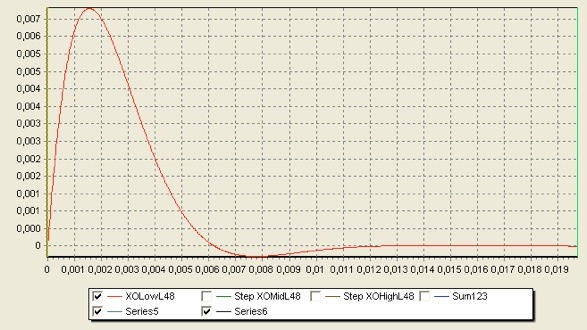 value of 0.0068 at sample 74 (shown by Acourate at the right side of the graph. Therefore the curve has to be selected by the Active Curve radiobuttons). Sample 74 means a time of 74/48000 = 1.54 ms.
Acourate tells us that the max. value is 0.1459 at sample 3. The peak is at a different position. The highpass peak has the value 0.6542 at sample 0. We can see that the three filters have their peaks at different times. All filters start at the time 0 but the reaction takes place at different times. For a better comparison the time axis of the three curve graphs is left unchanged. Let us study the behaviour of the step response. First comes the tweeter (ideal tweeter + real highpass), then the mid driver (ideal midrange driver + real bandpass) and with a delay of about 6 ms the reaction of the woofer (ideal woofer + real lowpass). It is important to understand what is happening here. Even in the case that we have our assumed ideal speaker drivers the resulting step response is determined by the minimum phase crossover filters. 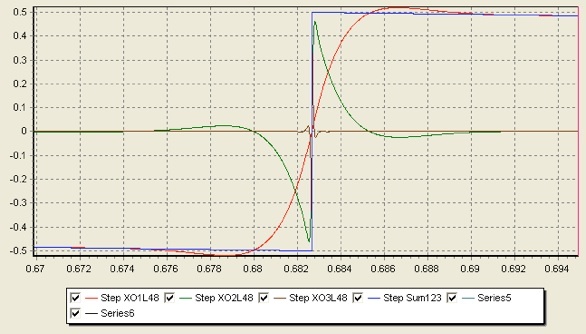 We can also suspect that the well-known and often published step response curves are also a result of the applied passive crossovers. If a passive crossover is substituted by a digital crossover but the design is following the standard minphase definition then we will get NO IMPROVEMENT. To understand a little more about the minphase behaviour let us explore a crossover of higher filter order e.g. the same Butterworth filter but instead of order 2 now with order 20. What is predictable anyway is a longer delay with higher filter orders. The more steep the slope is the longer is the filter length or simply spoken the more delay is given. This we can see in the picture 6. Doesn’t the step response look really bad? 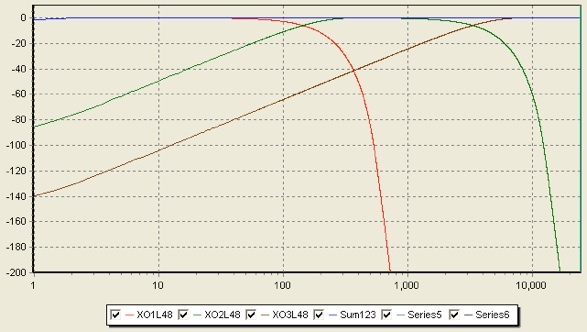 No wonder why people with sensitive ears tend to prefer very low crossover filter orders. Please also not that the woofer now instead of 6 ms (2nd order) reacts at 14 ms ! We can definitely see with the higher order minphase filter that we have to expect different expanded delays for different frequencies. And we can consider this as a serious time distortion. Is the time distortion the only bad effect? No, for example let us take a view on the amplitude response of the sum signal of the 2nd order Butterworth crossover, given in the blue curve of picture 7. The amplitude at the crossover point is – 6 dB. This means a value of 0.5. But it seems that 0.5 + 0.5 is not equal 1.0 (0 dB). We get -8 dB to -9 dB. The reason is that we add two signals of the same frequency but with a different phase. In the best condition we can get the desired 0 dB, but in the worst condition two signals with identical frequency can even cancel each other. This is not the case here because the phase shift is not 180°. But in any case we do not get the expected straight frequency response. Conclusion: Minphase crossovers have disadvantages. Different type of minphase crossovers have different type of disadvantages. With higher filter orders the behaviour gets worse. This has lead to the preference of low order filters. But also low order minimum phase filters result in time distortions. The different frequencies are played at different times. Is it a wonder that we have a never ending discussion about the quality of speakers? Please note that we have discussed here only the crossovers with the assumption that the drivers and the speaker cabinet behave perfect ! The pictures 2-4 show the peaks of the pulse responses at the positions at sample 74, 3 and 0 for lowpass, bandpass and highpass. Thus they are at different positions. An idea is to apply some delay for the bandpass and the highpass to bring all peaks together. So the idea is that the sum will have the highest value at position 74 and we get closer to a Dirac behaviour. This situation is shown in the next picture. 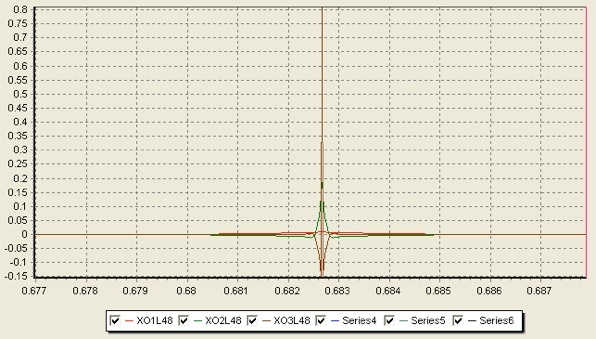 It has been created with Acourate by insertion of 71 zero samples at the begin of the bandpass time domain signal and by insertion of 74 zero samples at the start of the highpass signal. 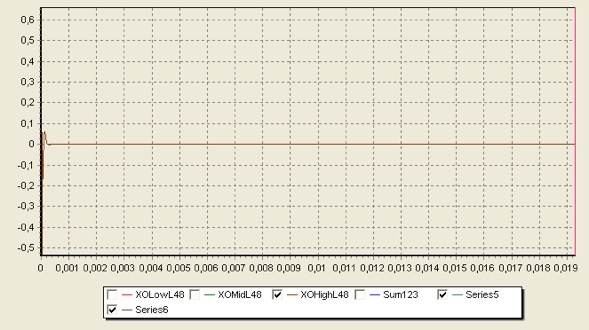 The next picture shows the resulting step response of the sum of the pulses (blue curve). 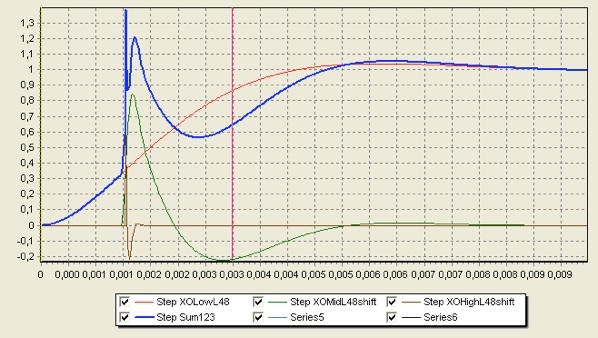 Also shown are the step responses of the crossover filters. 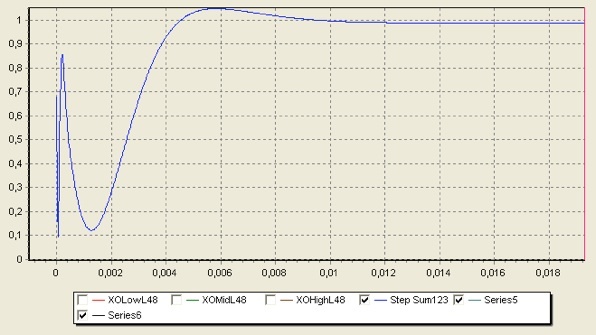 We can see that the step response still is far away from looking good. And we can already feel that the amplitude response also is not flat under these circumstances. In reality is has got even worse ! Conclusion: The trick of simply using additional delays does not help. Of course now we can try to apply other modifications. So e.g. you can look for the proposals of Le Cléac’h. But we already feel that this will only give suboptimal solutions. The previous two chapters show that minimum phase crossovers will not give perfect results. So we think about another solution. What we expect is a perfect addition of the crossovers resulting in a Dirac pulse. Then we have the 1:1 transfer and our crossovers behave together like the famous piece of wire. Let us look at 2nd order Butterworth filters with the same corner frequencies as in the previous chapters but now created by Acourate. 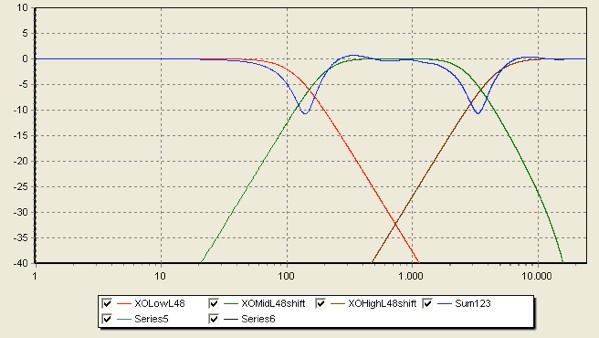 These filters show linear phase crossover filters. Linear phase filters show a symmetric behaviour. The peak is in the center. The centered peak of course has some important properties: we will get a delay. In our example with 65536 filter taps we will get a delay of 32768/samplerate seconds, e.g. at 48 kHz samplerate the overall delay is about 0.683 seconds. This is no problem if we have the sound without being accompanied by pictures (video). If we listen to music only the delayed playback doesn’t matter. (Remark: also in case of video a solution is possible. We have to accept compromises and to take mixed phase filters. They also allow a perfect addition but we will have restrictions on the filter slopes. Another solution is to delay also the picture, but this is considered to be difficult. And finally a solution is to simply accept the minphase crossovers as the ear becomes much less critical if the eye is concentrating on the picture). More important with a linphase filter is of course the question about the pre-echo or pre-ringing. If our ears will detect it then we will not accept linear phase filters. And this property of a linear phase filter is quite often be questioned and discussed. Let’s see. The amplitude response is shown in picture 12. But now we are interested in the behaviour of all three crossovers together. How to they add together? 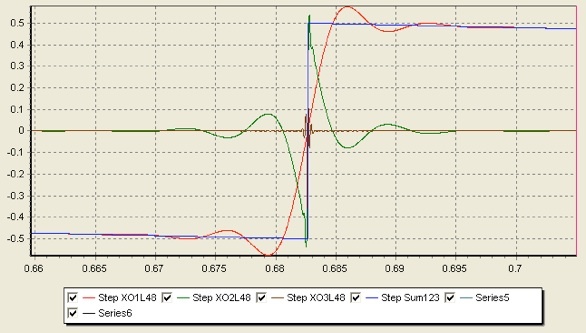 The three crossovers add to a Dirac pulse and thus the step response shows the behaviour that we wish. Please note that the lowpass shows an overshoot. But it is compensated by the bandpass. And this is valid at any time. The filters compensate each other so that the sum is perfect. Conclusion and discussion: With the linear phase crossovers generated by Acourate we get a perfect behaviour. The crossovers add up to a Dirac pulse. So we have reached a first goal in our speaker optimization. Based on the thought experiment with assumed perfect drivers we can concentrate on the behaviour of the crossover filters themselves. And it can be shown that linear phase filters allow us to reach the desired function. Fig. 16 Step response of the NT filter according to Fig. 15. Of course the steep slope of the NT filter (that is perfect if we really want to separate our driver from certain frequencies, e.g. resonances of metal membranes) shows more ringing. But the sum is still perfect. Fig. 17 Amplitude response of a R-Bessel filter of order 40. Our example in picture 17 and 18 shows a Bessel filter of type R. This means that we have a steep slope at the right side of the crossovers. The left side always has the order 2. This is a property of the Bessel filter. A remarkable property can be seen in the step response picture. We do not have any overshoot in the lowpass despite of the high order ! How is this all achieved? Why do we always get our perfect step response? We can simply do something that is much more difficult to achieve with passive crossovers: we can use the method of subtraction. If we subtract our first digitally generated crossover from the Dirac pulse then the rest defines a remaining part. And we can create a next crossover and subtract this again. By this way we get all our crossovers and of course they will in return add perfectly to our Dirac pulse. 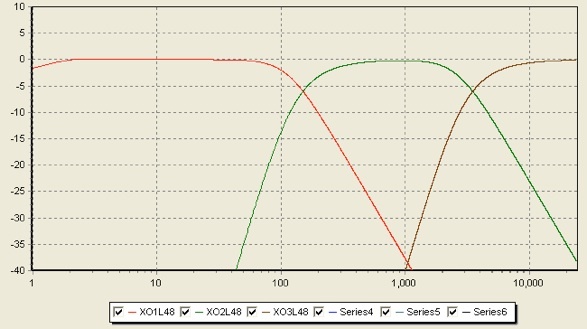 You should think about how to achieve this with passive analog components only. Can the subtractive method also get applied for minphase filters? Acourate will allow you to play with this and to study the result (Acourate is intended as an audio toolbox and not as a one button solution). You will find that you can do it but the amplitude responses will look very weird. The linear phase approach shows a much better behaviour. 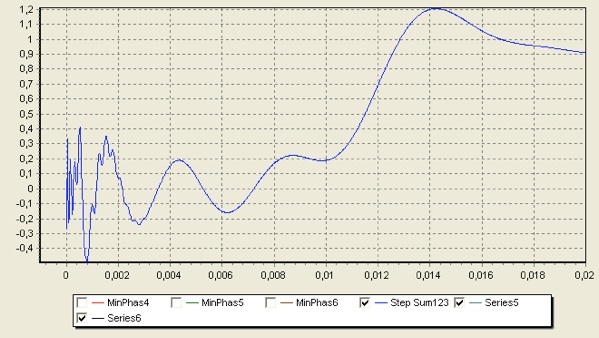 But it is also possible to create mixed phase filters by making some compromises (especially regarding steep slopes). The mixed phase filters have much less delay. So a delay down to about 60 ms should be possible. If you do listen to music only then time is not important and thus linphase filters are preferable. All the discussion is based on the assumption of having perfect drivers. But speaker drivers are not perfect. Is the approach shown here still valid? YES. Let us consider a bandbass. We have to expect that in the passband our driver should already behave well. In the transition area and in the stopband the driver has less influence, especially in the stopband as the driver should simply spoken get no signal to play. So the crossover has to be selected so that the good properties of the driver are used ! If the driver does not have a good behaviour we should not use it. The goal is to select the driver’s frequency range where the driver behaves well by nature (its own physical properties). Then only some small non-perfect properties have to be corrected (e.g. a correction in the stopband is senseless). The driver has to be linearized. And the good news: Acourate supports this linearization. The idea: if the desired crossover plus the driver plus the driver linearization behave like our ideal crossovers shown in this whitepaper then the synthesis of a good sounding speaker is no longer a fiction, it becomes reality.